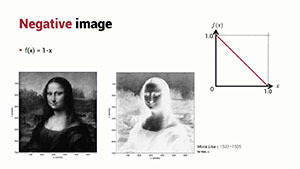 Let’s look at some simple monadic functions such as type conversion, brightness and contrast adjustment, inversion and posterisation and the effect they have on an image. 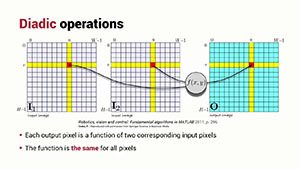 An important class of operations are monadic, which map an input image to an output image of the same size by applying the same function to every pixel. 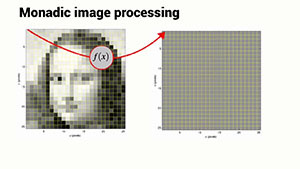 Let’s recall the key techniques we’ve covered including monadic and dyadic image processing operations and efficient ways to write these in MATLAB using vectorization. Imagine a scene with bright objects against a dark background. 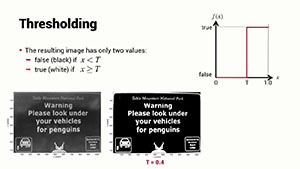 Thresholding is a very common monadic operation which transforms the image into one where the pixels have two possible values: true or false which correspond to foreground or background. It can be performed with a single vectorized MATLAB operation. 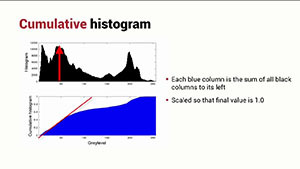 We can bring together what we’ve learnt about histograms and monadic operations to implement a technique called histogram normalization which is great at highlighting fine detail in an image. 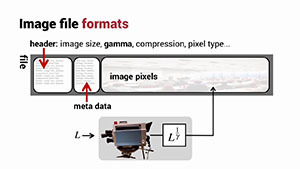 Almost all cameras apply gamma encoding to the images they output. Let’s talk about what gamma encoding is, why it happens and how it is decoded.